Went to a TNT with a few friends and the results are not so good... Ran a new pb with the turbo set up. 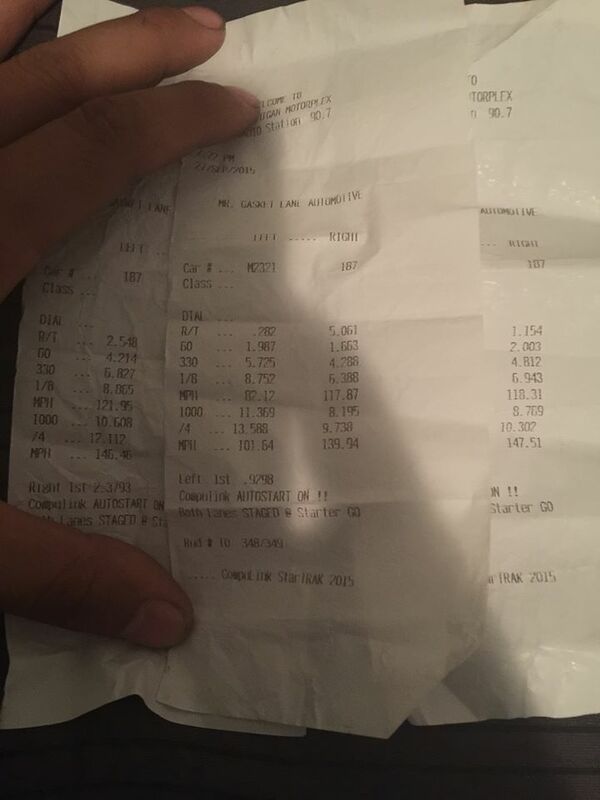 But it was on low boost, I let off before the 1320 and I only launched on 5psi. My slowest pass was due to driver error at the line but I managed a 121mph trap in the 1/8th lol.. my in the middle pass was full boost but leaving from an idle. Here are the slips (I'm 187) and a video of my 10.3 run. Very impressive, congrats on the PB. Was it a good, clean run ? Or could it do better yet ? I never had a clean run the whole day :/ I had a lot of driver errors with the new Trans brake and 2 step set up... So I could of done way better. I think low 9's is really do able with this set up. How exactly does the transbrake work with the 2-step? Is it all wired to the same switch? It is, The 2 step and T-Brake are on the same button.. But the boost controller is off the foot brake to stage the car and build boost. I'm going to try and have that wired to the button as well.